When Pluto splashed into our collective consciousness last month suddenly ready for its closeup, I learned a lot I hadn’t known. For instance, that although the orbits of Pluto and Neptune overlap, they are prevented from colliding by the stable 2-to-3 ratio in their rotations around the sun; Pluto goes around the sun in 247.94 earth years, and Neptune in 164.8, and 247.94/164.8 equals 1.50449…. This kind of mutually influenced periodicity, as it turns out (how was I an astrologer for thirty years without learning this? ), is common among pairs, trios, quadruples of planets, moons, asteroids, and so on, and is called orbital resonance. Three of the moons of Jupiter exhibit rotational ratios of 1:2:4, and there’s even an asteroid that has a 5:8 dance going with respect to the earth. This is truly the harmony of the spheres, the surprisingly simple mathematical relations that planets in a rotational system fall into in response to each other’s gravity. I think I can rest assured that no humans will ever attempt to play this. (If you look closely, you could find that, aside from the bass line articulating the 9-rhythm, there are always nine notes in every “simultaneity,”* and that the voice-leading is extremely chromatic; it’s pretty minimalist.) In order to get the kinds of rhythms suggested by the orbital resonance inspiration, I had to offset each cycle by a 32nd-, 64th-, or god help me 128th-note (I almost got used to double-dotted 16th notes) so that no points in the cycles would ever coincide. So it’s a sustained study in a quality of rhythm I’d never used before, and one which better allowed for melodic connections among the cycles. If you follow me. If you’re technically inclined I’ve got program notes that go further into the form, which is more logical than may appear on first hearing. For years I’ve been trying to write something more elaborate both microtonally and polyrhythmically (and polytonally) than Custer and Sitting Bull (1999), and this is it: Nancarrow fused with Ben Johnston and La Monte Young with a dash of Piano Phase thrown in. (And by the way: this is not spectralist music, which approximates the harmonic series. This music actually employs the harmonic series, as Harry Partch, Ben, and La Monte were doing decades before the spectralists got started. The piece opens with the 65th and 66th harmonics of Eb and closes with the 54th, 55th, and 56th. Neither European 1/8th-tones nor Bostonian 72tet are sufficient for such distinctions.) I’ve got several other pieces for this setup started, and hopefully I’ll finish some of those as well. I’m hoping I might so well internalize the outlay of notes on the three pianos that I can skip the pitch-bend step and reduce the tedious part of the workload. 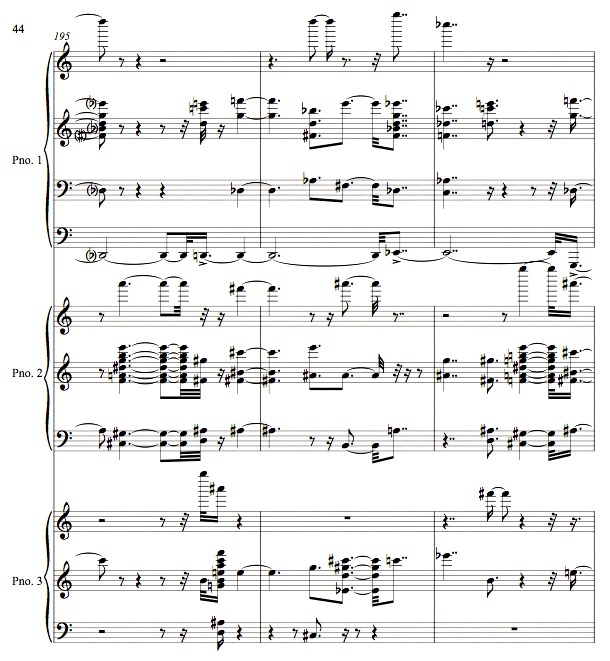 There’s a PDF score on my score page if you’re technically intrigued. And as with Custer, I’ve dedicated the piece to Ben, who in 1984 started me down this incredibly labor-intensive road. This brought to mind the very different yet related Wheel of Stars by Jim Bumgardner. Here is his description along with the link. You are watching, and listening to, a musical clock made of stars. Basically, this is a very literal kind of “music of the spheres,” and is typical of my projects, which often involve circles and music. This idea for making a music box out of stars was a natural progression from some previous projects of mine, like the Whitney Music Box, and Musical Chess, which you might also enjoy. My childhood friend, Richard Ellenson, talks about how the future is already here, if only we connect the dots. In terms of music, it’s exciting to have the sounds of the piano presented in new ways. Orbital Resonance is filled with beauty and interest and most definitely comes alive. Much of what I admire has to do with how this performance is by technology I have termed the meruvina, taking advantage of its technical and expressive capabilities. Harry Partch once wrote about instruments appearing someday that could change tunings instantly and without limit. That time is now and it’s good to have music that connects the dots around us. While we still have relatively clean air to breathe, and are not literally cooking in heat, I hope the world decides to connect the dots all around us with ways to provide energy that doesn’t threaten to extinguish life. From Hills of Snow, was inspired by a recording of raga Bilaskhani Todi by sitarist Rais Khan and sarangist Sultan Khan. Bilas Khan composed this elegiac raga in the sixteenth century for the funeral of his father, Tansen, one of the greatest figures in the history of Hindustani music. Tansen had disapproved of his son’s marriage, and they had not spoken for years. Upon completion of its first performance, this profoundly moving raga miraculously caused Tansen’s arm to move with a gesture of forgiveness. Lovely. The hyperchromatic runs sound especially gorgeous. KG replies: Thanks, Brian. Especially appreciated coming from you. Cool stuff. 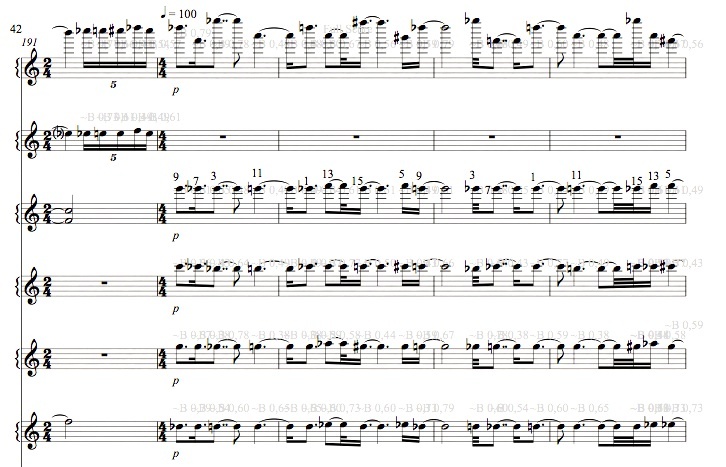 Did you get my email about Lime (music notation software), by the way? It’s all this sort of pitch-bend business that motivated me to reach out to you about it in the first place, plus the rhythmic perks of course. KG replies: Yes, I downloaded it. Hoping to find time to explore it someday. Things chill out once school starts. Interesting piece! There’s a kind of ‘loneliness of fixed determinants’ quality. Very celestial!